Tony Blair will make the statement to MPs on Tuesday about a possible referendum on the planned EU constitution, Number 10 has said. British voters look set to get a vote on the issue in what is being seen as a major U-turn by the prime minister. The Conservatives and Liberal Democrats have welcomed the government's apparent change of heart. Tory leader Michael Howard said there was "no reason at all" why a vote should not take place this autumn. In the House of Commons on Monday, he mocked the prime minister, saying he welcomed his "big U-turn". And he claimed that if Britain were signed up to the EU constitution, it could have been the European president and not the prime minister that would have been in Washington for talks last week. Mr Blair responded that it would be a "pleasure to debate the reality and not the myth" with the Tory leader. Mr Howard criticised suggestions the government would wait until after the next general election before holding a vote. "There is no reason to play games," he said. "I don't think he [Mr Blair] would necessarily give a specific date but there's no reason why he should not say we will hold this referendum as soon as possible." It is thought the government instead wants MPs to scrutinise the constitution first. 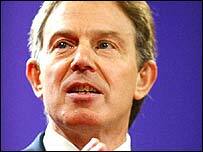 Mr Blair addressed Labour backbenchers at their weekly private meeting on Monday evening. But a party spokesman said he had stressed he would not "prejudge" his Commons statement and had told MPs they had to fight the constitution argument on substance, not myths. Liberal Democrat leader Charles Kennedy welcomed the referendum plan but attacked the way it had been announced. "It's something that's been building and building for so long and yet has been carried out so far by a series of off-the-record briefings and nods and winks," he said. "That is not the way you conduct, far less win, referendum campaigns. You've got to take your argument into the heat of the battle in full public gaze." The constitution has been drafted by a special European Convention but EU leaders have not yet agreed the final document. It will replace earlier EU treaties and ministers say it will streamline decision making when the EU enlarges from 15 to 25 members in May. Bob Worcester, founder of the polling company Mori, said he thought the result of a referendum was likely to be "extremely close". The prime minister has previously said the vote was unnecessary because the treaty would not fundamentally alter Britain's relationship with the EU. But on Saturday he told BBC Radio 4's Today programme Conservative threats to renegotiate the treaty, if they were successful in a general election, could make a poll necessary. The new constitution must be approved by Parliament within two years. The Tories planned to make the referendum a central issue of their campaign for the European elections on 10 June but argue there are many other issues at stake in those polls. A spokesman for the UK Independence Party - which campaigns for withdrawal from the EU - said: "Whatever the government says this is a referendum about being in or out of the European Union." "A relentless campaign by the Murdoch press meant the issue wouldn't go away"
Will parts of constitution live on? Can EU members agree budget?